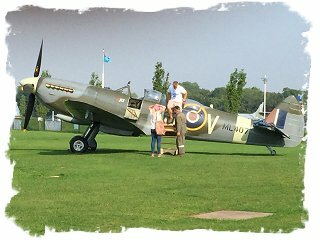 I watched as the Spitfire, a veteran of the Battle of Britain, gently touched the sod of the country it had fought for some seventy odd years ago. The roll out was straight and the track was true and the beautiful craft had slowed to almost a taxi pace when suddenly the left wing went down. The big fighter slewed and started to go over. It poised with the tail high in the air, just at the tipping point, where an inch further would send it onto it's back, then it settled back on the right main gear and the left wing tip, the tail still high above the ground. There was a collective moan from the watching crowd, mine probably one of the loudest. I was visiting England last month and my host suggested a trip to Sywell Aerodrome, which was an RAF training field during the war. The aerodrome resembled the quintiessential RAF base that we've seen in dozens of WWII movies and it shined in the afternoon sun. is the largest flattest expanse of green that you can imagine, and on this Thursday afternoon a beehive of activity. There was a large picnic area behind the low fence and entire families were having lunch while watching the activity. 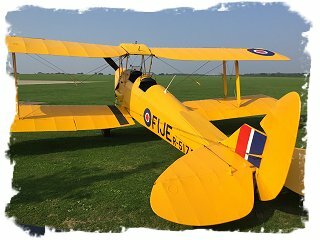 Besides the Spitfire, there was a DeHavland Chipmunk and a Tiger Moth giving rides to all comers and there appeared to be plenty of customers. The local flying club was busy with students and the restaurant in the terminal was bustling. Apparently, aviation is still special in England, as it was here in America forty years ago when I got into the flying business as a young man, and it cheered me to witness it. There is also a Battle of Britain museum at the aerodrome that was closed this particular day, but thanks to the kindness of the curator, the Yanks got a peek. It was overwhelming, and my plan is to go back and spend a day there. The smallest artifacts are shown and described and there was lots of salvage from the battle wreckage with a description of where and when the aircraft went down. Allied and German alike, all things were displayed with a reverence that spoke of the importance of the tiniest bit of England's history during this epic time. Anyway, the failure of the left gear on the Spitfire got me thinking about how old these aircraft from the big war are now and how incredibly difficult and scary it is to maintain them. Year after year there are less spares and when something breaks there is always the possibility that the needed part can't be found. I was standing next to the wife of the gentleman flying the Spitfire when the accident happened and I could see the hurt on her face as she saw the old aircraft damaged. The surviving men who flew these aircraft are in their ninties now and their ranks are thinning quickly. We are so blessed to still have a few to link us to the time these aircraft helped save the world. Sadly, there will soon come a time when the last warrior pilot is gone and we have only their recorded words connect us to their story. The aircraft though, live on through the dedication of the men and women who keep them flying. and through their doing, giving the ones of us who care, a living link to the past. It must be faced though, that someday the machines will follow their human pilots. There will come a day when one of these magnificient aircraft will be the last of it's breed to fly. At the end of that flight it will taxi to a rest, the mixture on the Merlin will be pulled, the engine silenced and the shining disc of it's propeller will slow, then stop. On that sad day history will be religated to the museums and we will have lost the living touchstone that brought the past alive for us..